The Mermaid's Tale: If a bird calls in the forest and no one hears it, is it there? If a bird calls in the forest and no one hears it, is it there? An interesting discussion has been going on in the British birding world for a few months now. The topic was mentioned on the 8/23 airing of "Material World," which is how we came to hear about it. The show included mention of a discussion of the issue in "British Birds" starting here, in March, with follow-up here. The author of the original piece, Richard Porter, is one of the UK's top birders. Fifty years ago, in the spring of 1962, I took part in the first year of the BTO [British Trust for Ornithology] Common Birds Census, my patch being in the grounds and adjacent woodland of the National College of Food Technology at Weybridge, in Surrey. 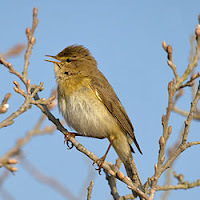 One of the commonest birds was the Willow Warbler Phylloscopus trochilus and most were located by ear. If I repeated the census now, and assuming there had been no population change, my counts would be much lower, as I would be failing to pick up many singing birds. The ageing process! Bird counts, done by numerous expert volunteers, are crucial to knowledge of which birds are where when, and to the construction of bird atlases and so on. Good birders rely as much on their hearing as they do on their eyesight to locate and identify birds, if not more, so hearing loss is a common topic of conversation among aging birders -- "I can no longer hear the black and white warbler, though I could last spring" -- and always mourned. High pitches are often the first to go with age-related hearing loss, and of course bird song is generally high-pitched. But then again, most birders know when they aren't hearing a bird song -- they see the beak moving but hear nothing, so how much of a problem this is isn't clear. The stereotypical birder is an eccentric old lady traipsing about in the brush with binoculars around her neck. How representative she is of all birders is not known: birding organizations, at least British bird organizations, currently don't collect data on volunteers. But what if birders are by and large an aging population, and bird counts rely predominantly on them for data? Bird counts could look like they were shrinking when they were in fact going in any direction; up, down, or nowhere. The BTO acknowledges that this could be a problem, but they don't believe it's a major one, saying there are plenty of young birders coming along. There surely are, but we still don't know the age distribution of bird counters. Whatever the demographics of this particular group, this story interests us for a few reasons. First because it is curious to wonder how accurate bird counts actually are. Already there's the sampling nature of the counts -- birders can't be everywhere and count every bird and yet it's not possible to know what proportion of the population of any given species is missed. So, if some are missed in areas that were thought to have been well-covered, this can produce an inaccurate count even of areas thought to be accurately counted, as Richard Porter suggests. But it also represents an issue that is true of probably every survey ever done: there are variables, known and unknown, that influence the outcome but that can't be measured, or that aren't measured because no one thought to measure them. These are known as confounders in epidemiology, and the field is plagued by them, and they probably explain more non-replicable results, more false negatives and more false positives than any other factor. But because of their very nature, we most often can't know which. And what about extinctions? 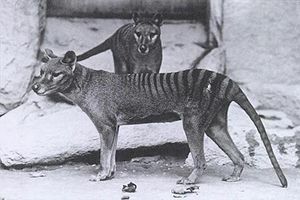 Is the Tasmanian Tiger extinct or isn't it? Thousands of "unconfirmed" sightings have been reported since it was declared extinct in 1936, for example. Are they credible? A good succinct piece about what biased reporting means for extinction statistics over at Smithsonian.com suggests that what we know about extinctions depends pretty heavily on reporting rates. A lot more extinctions are being documented in the US, Australia, and other rich nations and many fewer in many parts of Africa, and, say, Paraguay. It turns out that the difference is pretty clearly due to discrepancies in reporting -- everyone's doing an equally poor job of protecting endangered species. And then, of course, there's all the politics of conservation biology -- it's not all bad if your favorite species looks more endangered than perhaps it is because that gives funders motivation to send money your way. How common that is, of course, is unknown. Are we getting at least a good sense of the direction population counts are heading in? We hope that reporting bias isn't so bad that even this is unknown.